An assistant sub-inspector was shot dead on Friday morning as police raided a forest to catch Bimal Gurung, the leader of Gorkha Janmukti Morcha who is wanted by the Bengal government over deadly clashes and a 104-day shut down that crippled the Darjeeling region this summer. Gurung’s GJM has been demanding a separate Gorkha state, and an unrest that flared on June 8 has till now claimed the lives of 13 people. The last death was on August 31 of a protester in a rally in Darjeeling. The clashes began inside a forest at Lapchey Bustee, about 20 km from Darjeeling town. Unconfirmed reports said a few more people could have died in the clashes. According to police sources, the person confirmed dead was Amitabha Mullick. GJM is an ally of the BJP-led National Democratic Alliance (NDA). In addition to clashes with police, its members forced a 104-day shutdown in the hill region that crippled the local economy that relies heavily on the summer tourism. The strike ended 16 days ago but the state government has not relented efforts to catch Gurung, who has been charged under laws relating to terrorism. Acting on intelligence that he may be hiding in the forest near Lapchey Bustee below Patleybas, the headquarters of the GJM, a police contingent raided the spot. Clashes began around 5 am and t continued till last reports came in at 10:00 am. Sources said a GJM supporter was also wounded. Earlier, police believed Gurung was hiding in Sikkim for a large part of the 104-day-long bandh that started on June 15. Friday’s clashes threaten a fragile peace in the region. On Thursday night, Gurung told the local media that he will appear before his supporters on October 30, and urged the hill people to hit the roads in lakhs on that day. “If I need to die, I will do so before the people,” Gurung said. Gurung’s announcement came in the wake of the Centre’s move to discuss the state of affairs in the Darjeeling hills. The state government, too, is supposed to hold the bilateral meeting at the state secretariat on October 16. The state government has already appointed Binoy Tamang and Anit Thapa, two leaders expelled from the GJM, as the chairman and vice chairman of board of administrators in the Gorkhaland Territorial Administration (GTA), the semi autonomous body to run the affairs in the hills. There is a virtual split in the GJM with Binay Tamang leading a faction that is backed by the state government. Gurung leads the other faction. 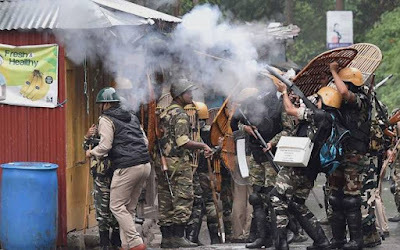 Darjeeling - An assistant sub-inspector was shot dead on Friday morning as police raided a forest to catch Bimal Gurung, the leader of Gorkha Janmukti Morcha who is wanted by the Bengal government over deadly clashes and a 104-day shut down that crippled the Darjeeling region this summer.